Twice Baked (Stuffed) Potatoes – A Side Worth Talking About! Next time you want to make potatoes, and you want to try something completely different than the normal routine (and you all know what I’m talking about! ), try this on for size. 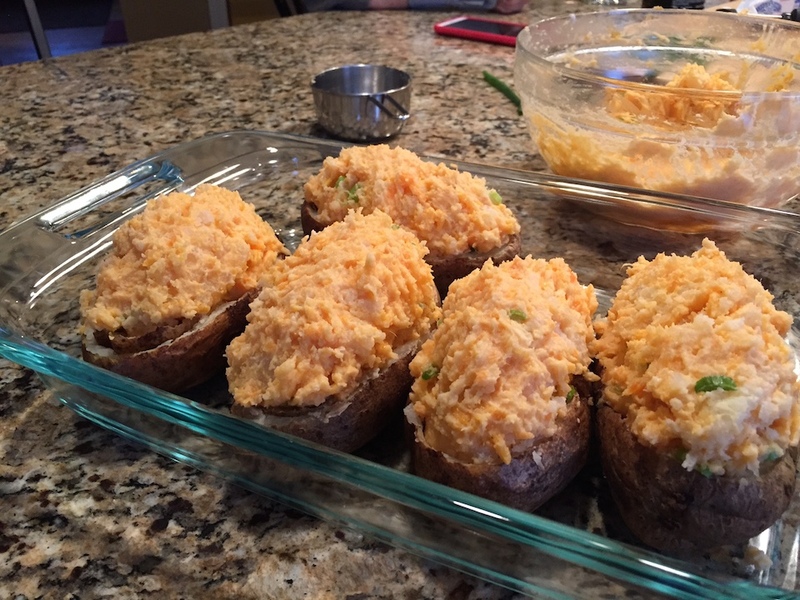 Twice baked or “stuffed potatoes on the grill. These are so easy to prepare, can be made with a myriad of fillings, have such a wonderful texture coming off of the grill, and truly make an incredible presentation at the dinner table. 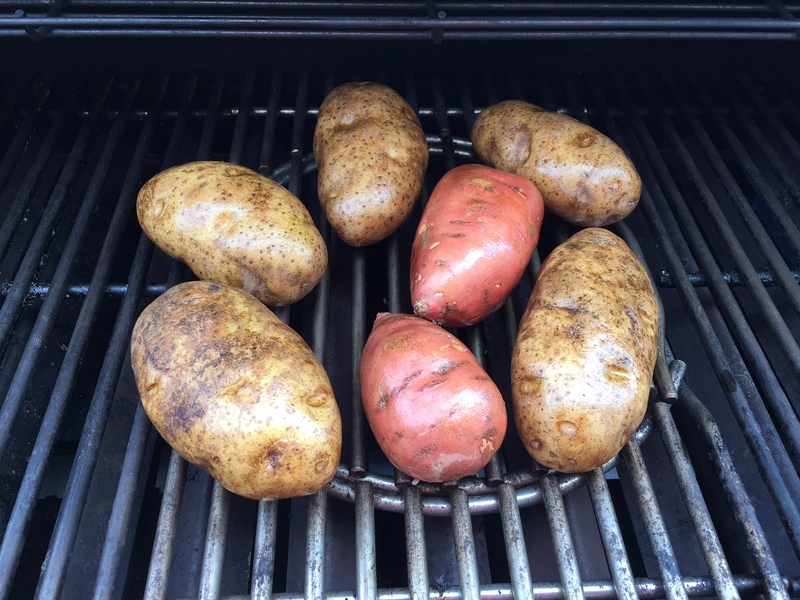 The first part of this process is baking your potatoes in your Weber grill (gas or charcoal). The best kinds of potatoes to use are standard Russet potatoes. These bake excellent and are so easy to carve and scoop out. These are done on the grill with indirect heat for about an hour at 400 degrees F.
You will want to scrub the potatoes first but don't poke some holes in it until about 30 min into the cook. Some people like to put foil around the potatoes but they can also just go right on the grates. You’ll read about my Russet and sweet potato combination later. After an hour, puncture the potatoes with the tip of a knife and if the knife goes through soft as silk, they’re done. Bring them inside to cool slightly. Once inside, it makes it easier if you hold the potato lengthwise in your hand on a clean dish rag/towel so it doesn’t slip. 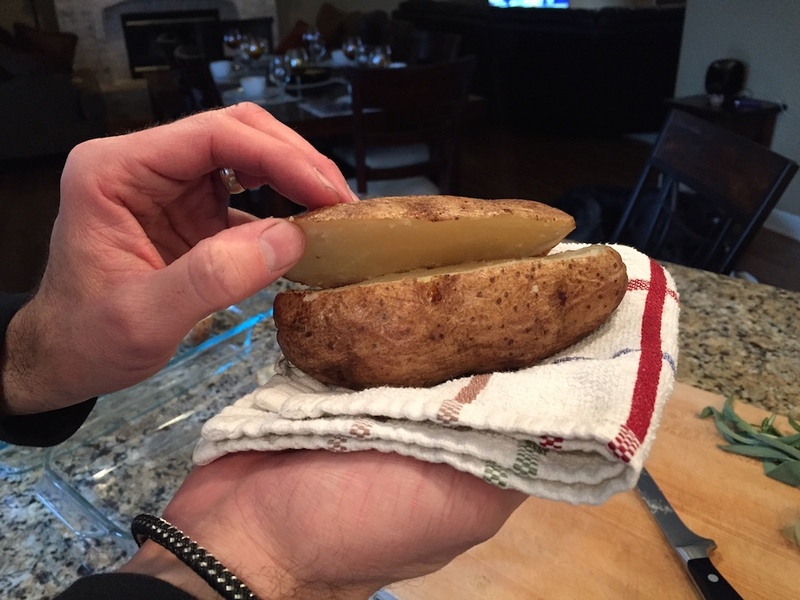 You then slice off the top 1/3 of the potato – and don’t throw it out!! You will use this in a minute. Please set aside that top portion. Once all of them are sliced, scoop out all of the insides from both the top and bottom of the potato into a bowl. 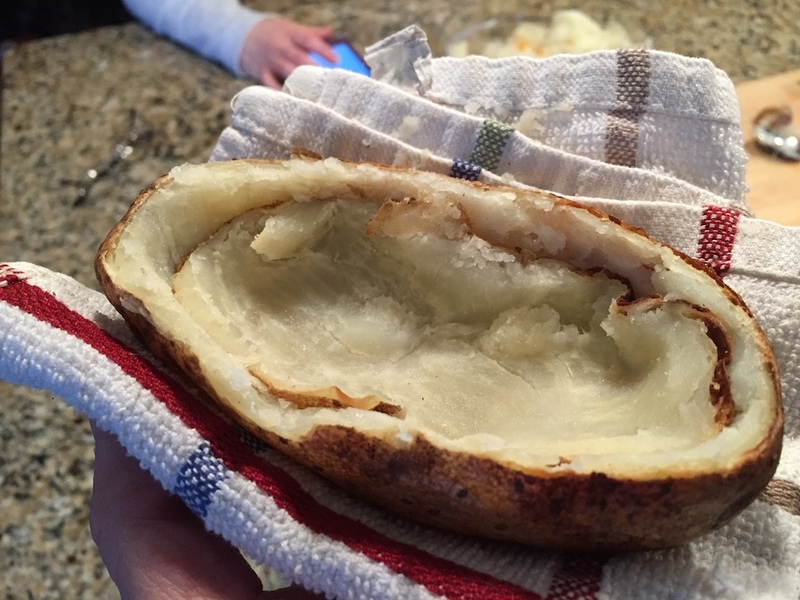 Now you insert those reserved “tops” and place them back inside of the potato you just sliced. That’s right! This adds stability to the potato and makes a riser for the wonderful stuffing you decide to stuff it with. Now, after all of the potatoes are reconfigured, you can mix/match anything you want into the scooped potato mixture. This past Thanksgiving, I asked my 3 boys what kind of potatoes they wanted. None of them could agree, so I took the liberty of making both Russet and sweet potatoes (kind of a marriage of mashed potatoes and sweet potatoes) and mixing them together with sour cream, sharp cheddar cheese, chives, butter, and sprinkled it with smoked paprika to bring out the color. Your mixture can be made with just about anything. Once combined, load the potatoes back up – piled high – and place them back on the grill for another 30 minutes or until nicely browned over indirect heat at 400F. It’s that easy! Note, you can use whatever dish you want, as long as it's grill safe. I used the glass Pyrex as the prep plate but used an old cookie sheet on the grill! The reality is you can place everything directly on the grill grate. I just liked having them on one pan. 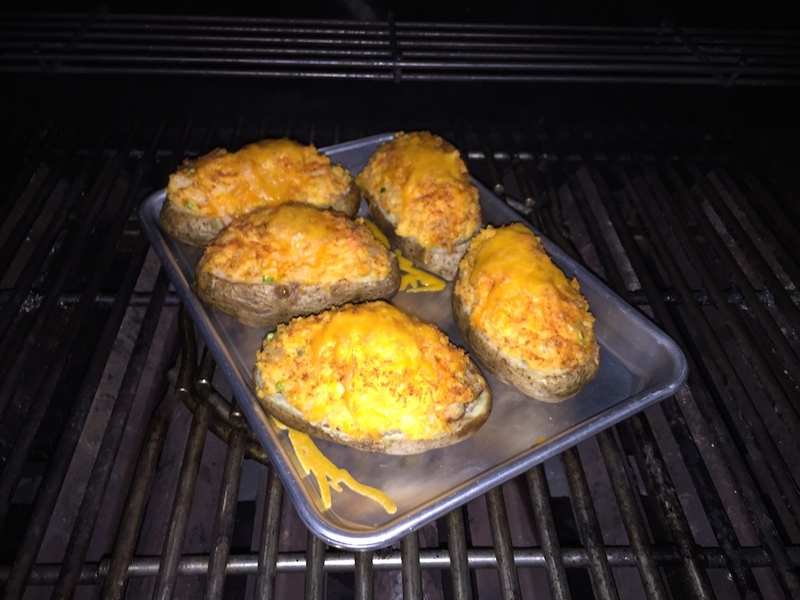 Twice baked potatoes on your Weber grill. Now, that’s a side worth talking about! This will surely be a hit at your table. See you next time and Happy Grilling!